Summer DLAB experiments with the integration of algorithmic / generative design methodologies and large scale digital fabrication tools. 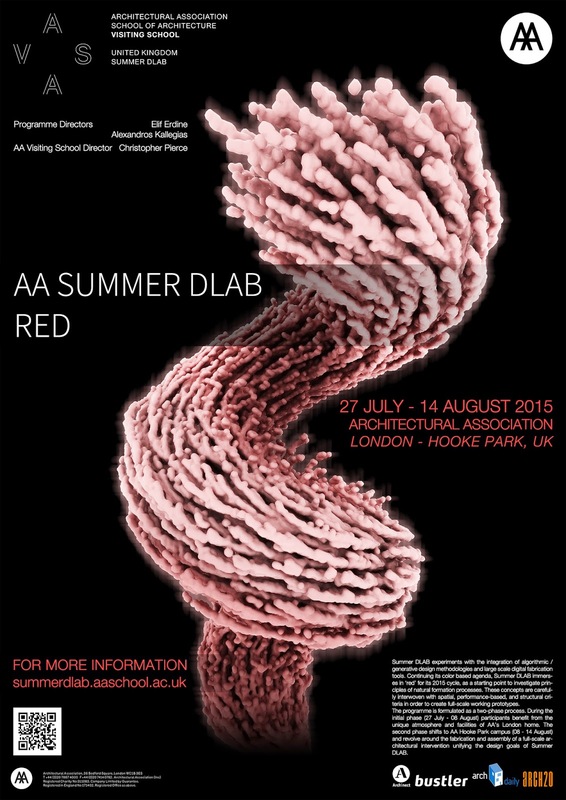 Continuing its color based agenda, Summer DLAB immerses in ‘RED’ for its 2015 cycle. RED is the starting point to investigate principles of natural formation processes and interpret them as innovative architectonic spaces. These concepts are carefully interwoven with spatial, performance-based, and structural criteria to create full-scale working prototypes. Summer DLAB RED will explore the phenomenon of decay in nature. By investigating the process of decay across various scales in natural organisms, we will formulate rules of generating decomposition as our design research area. These rules will then evolve into design strategies for the creation and fabrication of a large-scale prototype. The design and fabrication process will be aided by robotic fabrication techniques in AA’s Hooke Park premises. The three-week long programme is a two-phase process. During the two-week initial phase, participants benefit from the unique atmosphere and facilities of AA’s London home. The second phase, lasting for a week, shifts to AA’s woodland site in Hooke Park. It will revolve around the fabrication and assembly of a full-scale architectural intervention which unifies the design goals of Summer DLAB.